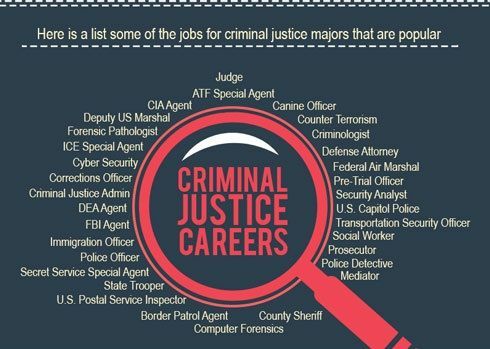 Which Criminal Justice Career Path Best Suits You? If you’re interested in a career in criminal justice, you’ve come to the right place. On this page, you’ll learn about criminal justice careers in the three branches of the criminal justice system, what you can do with a criminal justice degree and how to pick the right career for you. What are the Three Branches of the Criminal Justice System? Law Enforcement: These are agencies, police, and detectives who are responsible for keeping civilians safe and investigating crimes. The Courts: This is anyone who works within the legal system, such as judges and prosecutors. Corrections: These are the men and women who detain and supervise offenders. 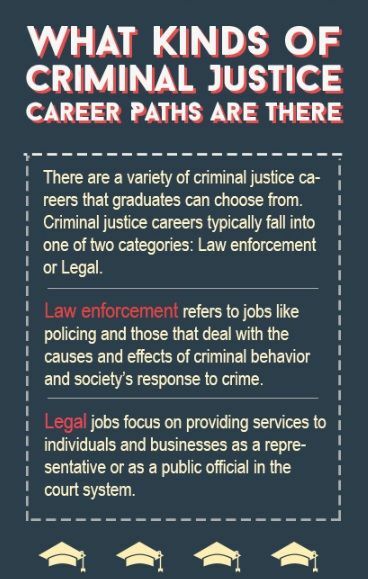 There are many paths toward a career with a criminal justice degree. Read on to learn more about criminal justice professions in each of the three branches. Law enforcement careers in criminal justice involve delivering justice by stopping offenders from breaking the law and protecting innocent people. This is the first step in catching perpetrators and gathering evidence that can be later used in a court of law. These roles typically make reports on crime in their area, investigate criminal activity, arrest offenders and deliver testimony during court proceedings. This branch of the criminal justice system offers the most career options, which we’ll go over in more depth below. Police officers are known for patrolling the streets and catching bad guys, but there’s actually a lot more to their role. Depending on the type and size of the organization employing them, law enforcement officers’ duties vary. They may write field reports, arrest and process criminals, testify in court and more. The education required to become a police officer ranges from a typical high school diploma to a college degree. Additionally, before getting on-the-job training, police officers must graduate from their agency’s training academy. Candidates must typically be at least 21 years old, a US citizen and meet a variety of personal and physical qualifications. Police officers work in an environment that can be dangerous, physically demanding and stressful. Police officers have one of the highest rates of fatalities and on-the-job injuries. If you plan to get your criminal justice degree and become a law enforcement officer, you’re looking at a profession that earns an average annual salary of $64,490 according to the US Bureau of Labor Statistics (BLS, 2017). Contact the schools on our site to learn more about entering this essential profession. Private investigators analyze and find facts about information pertaining to personal, financial, and legal matters. They offer many services that range from protecting celebrities, verifying people’s backgrounds, investigating computer crimes and tracing missing persons. As with most careers with a criminal justice degree, private investigators and detectives are required to be highly professional in their role. Both private detectives and investigators usually have some college education. However, most private detectives and investigators learn what they need on the job. Previous experience in investigative work is very helpful, and private detectives and investigators need a license to practice in most states. While on a case, some private investigators spend their time performing surveillance or conducting interviews, while others spend their time in offices making phone calls and conducting computer searches. Getting your criminal justice or criminal investigation degree and working as a detective can be quite beneficial financially, as the BLS reports that private detectives earn a mean annual salary of $55,080 in the US (2017). Forensic investigators analyze pieces of scientific evidence left at crime scenes such as bones, blood, or other fluids to help investigators solve crimes. Forensic tools are becoming more and more sophisticated as technology rapidly advances, and now you can become a forensic science technician online. The BLS says that forensic science technicians can expect to earn a mean annual wage of $61,220 per year, according to 2017 data. The BLS predicts a 17% increase in job growth between 2016-2026. Just to give you a comparison, the national average for all other occupations is expected to be just 7%. For a nice overview of forensic careers to help you pick a specialty, take a look at this handy document created by the BLS. Think You Have What It Takes to Work For the CIA? While most people think of high-risk undercover missions as the bulk of Central Intelligence Agency (CIA) work, this intelligence agency needs professionals with a variety of skills. The CIA pursues financial crimes, terrorism, executes military-style operations, and has many other responsibilities as well. In most positions, it helps to have a graduate-level criminal justice degree, such as your master’s in statistics, mathematics or computer programming. This would be the case if you want to work as an analytic methodologist, for example. They earn anywhere between $54,308 and $80,505 or more depending on their experience. Criminal justice students who want to work for the CIA can also look into student opportunities. They even offer an undergraduate scholarship and a graduate degree scholarship for students. Homeland security careers are all about preparing and protecting the US for the unexpected, from both natural and manmade threats. There is a range of career paths in this field, all of which plan for the worst to protect our nation. At the federal level, you may find a role in emergency management to provide resources to the nation in the event of a catastrophic disaster. Or, you could work at the state level in local emergency management to plan disaster recovery or focus on reducing hazards. In the private sector, you could prepare a company, hospital, or large corporation for the unexpected. After earning a bachelor’s degree in criminal justice or homeland security, you’ll need to pass medical and psychological exams, drug tests, and undergo a background check along with extensive interviews. On-the-job training is expected after landing a position, and many employers look for applicants who can travel. While criminal justice salaries vary, homeland security agents make lucrative pay. Information security analysts, for example, protect against cyber attacks and bring home a median of $95, 510 per year, whereas emergency management directors who lead emergency responses make $72,760 per year (BLS, 2017). The courts in our criminal justice system are run by judges. The individuals who work in American courts ensure that a fair trial takes place and the law is followed. The most common positions in the courts are paralegals and prosecutors, but there are many other career paths to take if advancing in the court system interests you. According to US News, paralegals help attorneys in every part of the legal profession, from summarizing legal precedent to drafting motions. Paralegals, like lawyers, can enter different types of law, such as family, criminal, immigration, and corporate. Their legal involvement in cases depends on their employer. Some have restricted and narrow roles, while others have a high degree of autonomy and responsibility. The best paralegals work behind the scenes and are team players. Most paralegals have at least an associate degree in paralegal studies, while others have a bachelor’s degree and obtain a certification in paralegal studies after they graduate. According to statistics from the BLS, paralegals earn a mean annual wage of $53,910. Lawyers or prosecutors either represent the state or federal government, and they look at the evidence collected by law enforcement to decide if charges should be filed against a person accused of a crime. Their jobs involve negotiating plea agreements, presenting evidence in a court of law and questioning witnesses. To become a prosecutor, you need to earn a bachelor’s degree in criminal justice or pre-law before continuing your education in law school. Law schools will often look for top undergrad students who took rigorous courses and earned excellent grades. After earning your law degree, you must pass the bar exam to gain licensure to become an attorney and practice in your state. Volunteer work, clerkships and internships will help you land a position after graduation, and are highly desired to help you gain valuable working experience in this field. Prosecutor jobs also pay well, but like many careers in the criminal justice field, openings and wages vary drastically based on location. According to the BLS, lawyers make an average of $119,250 per year (2017). Career One Stop projects the need for California lawyers will increase by 11% by 2026. Lawyers in California are also paid the highest wages at $168,200, whereas lawyers in Montana only make an average of $83,150 annually (BLS, 2017). Those who work in the corrections branch of the American justice system ensure that convicted offenders serve their sentences as the court suggests and supervise convicts currently serving time. Jobs in corrections commonly include probation, parole and corrections officers. A probation officer’s main job is to work with offenders who have been sentenced to probation, rather than prison, for their crimes. Probation officers write reports on various criminals to help the judge or courts decide sentencing and the level of probation the criminal is going to receive. In order to become a probation officer, candidates must receive a bachelor’s degree from an accredited college. Getting a bachelor’s degree in criminal justice, corrections, social work or psychology is preferred. To receive federal positions, candidates might be required to have a master’s degree in counseling, criminal justice, social work or a related field. Though requirements vary, some states also require probation officers to have at least two years of experience in correctional treatment or corrections parole. Probation officers earn $56,630 annually, according to the BLS (2017). A correctional officer’s job is to oversee individuals who have been arrested for a crime and are currently awaiting trial or who have been sentenced to serve time in a reformatory, prison or jail. To become a correctional officer, candidates must go through a training academy and then on-the-job training via a facility. While qualifications vary from agency to agency, all require at least a high school diploma or equivalent. Some can require additional work experience or a college education. The work environment for a correctional officer can be hazardous and stressful. While working with inmates, correctional officers can be injured, and they have one of the highest rates of overall injuries. Annual earnings for correctional officers averages at $47,600 per year according to BLS statistics (2017). The career outlook for criminal justice graduates is becoming more positive every year. A number of positions are available spanning the three branches of criminal justice, each with their own positive job growth prospects and requirements. There is a growing number of criminal justice careers to choose from, all with different educational and experience requirements. From paralegals and lawyers working in law offices, to police officers who protect people and property, the available roles in the criminal justice field are extensive. Criminal justice careers can also be more stable than jobs in other fields during tough economic conditions, which makes it a safer career choice than many others. With so many lucrative positions in the field of criminal justice, there are criminal justice career paths right for you no matter your skill set. Simply click any of the links above to learn more about each career path, and get in touch with schools for any role that interests you.